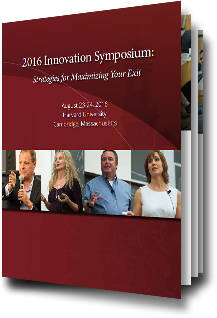 Download Your Free Whitepaper: "Maximizing Your Exit"
The 2016 Innovation Symposium, “Strategies for Maximizing Your Exit,” provided an opportunity for business owners to learn and craft a perfect exit strategy. This unique symposium was designed so participants would leave with a solid understanding of how to effectively plan a business sale and how to maximize the value of their business in a global marketplace. What can you do to make your company more attractive to potential buyers/investors? How do you get your business in front of the most qualified and strategically interested buyers?